Preschool contains learning lessons for ABC, numbers, matching, counting, coloring, draw dot-to-dot. The idea of creating this program is from my 2 and half year old son. He is attending preschool right now and i receive his homework everyday week from his teacher. Based on his home work, i created this program. Hopefully, it will benefit all other similar age kids. My son spends a lot of time on matching section and of course he likes the coloring too. This program contains coloring while learning ABC alphabet and 123 numbers with parent's assistant. 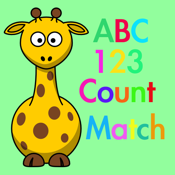 After learning alphabet and numbers, they can start doing the match and count section. try this program out and let me know what your kids like, i will create more upon request. While letting them have fun, this program will definitely serve as a great educational tool.